It is that time, you are feeling bored and are ready to change things up in your home. Perhaps you want to add color or a trendy pattern to your room, but your old brown couch is standing in the way. Not to worry, at Treasure Coast Window Fashions serving the Greater Jupiter, Jensen Beach, Hobe Sound FL areas, we’ll be happy to give you some quick ideas for room updates. Slipcovers are not what you remember. Years ago, our grandmothers covered their furniture with plastic, zipped covers that stuck to our legs in the summer and made noise every time we moved. Today, slipcovers change the entire color scheme of a room without the expense of reupholstering the furniture. By using slipcovers on furniture, a colonial classic room can become an art deco masterpiece in minutes! Or, why not consider a seasonal slipcover to help make your space warm and cozy for the holidays? Thank goodness those old slipcovers are a thing of the past. 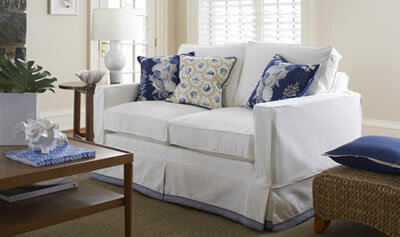 Slipcovers can be made from a variety of fabrics, in any color or pattern you choose. They can even be found in popular upholstery choices such as suede, brocade, and damask. One of the main reasons to purchase slipcovers for sofas is to maintain the original upholstery for longer. Slipcovers for couches are usually fitted by the length, height, and width of the sofa and are easily installed and removed for cleaning or storage. Slipcovers that can be purchased for a few dollars resemble inexpensive bed linens. Whenever anyone stands up from the couch, you must tuck the cover back into the cushions. Spending a few more dollars having your slipcover custom-made can make all the difference between a stunning furniture ensemble and a grouping of poorly upholstered furniture. Use complementary decorative pillows to add unique textures, patterns, softness, and depth to a room. Reupholster your dining room chairs in custom fabric to instantly change the look and feel of your room. Add an area rug to define a conversation area or add pizzazz to any room. Try placing your rug at an angle, such as under a coffee table, to help it stand out. Rugs are a great way to add a new color to any room, or freshen up otherwise dull floors. Finally, say “no” to clutter. Nothing diminishes the look of a room more than clutter. Clear the clutter by using crafty storage spaces for papers, mail, toys, coats, and other items that can give a room a disorganized, messy feel.